The new 2018 Toyota RAV4 is now available with a new Adventure grade trim package. 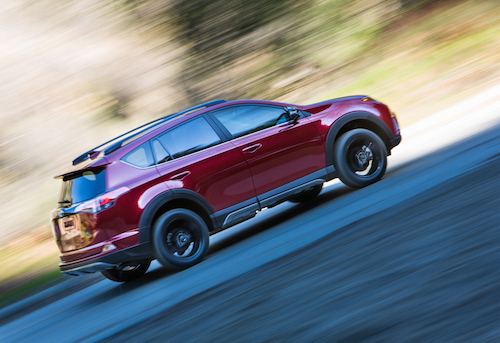 New Toyota RAV4 Adventure models offer a combination of features found on XLE and SE models including new sporty exterior accents, The new RAV4 Adventure has large over-fender flares and 18-inch five-spoke black alloy wheels with significantly larger tires than other RAV4 grades. It has been raised for more ground clearance (now 6.5 inches vs. 6.1 inches) for better off-road and all weather driving. Our Toyota Dealership near Somersworth, NH is pleased to welcome this new 2018 Toyota RAV4 Adventure model to the lineup. If you would like to learn more about this exciting new RAV4 please contact us or better yet, stop by for a test drive soon.